The Grimoire: Fill The Pages & Bring it to Life... By: Sabrina, The Ink Witch We believe The Grimoire is the most unique journal/magical book on the market with over 400 lined pages, most etched with Sabrina's Inspired artwork, together with beautiful separator pages. Each page was hand designed by graphic artist and author, Starrfire Price to create a journey with each flip of the page. Sabrina's beautiful artwork imagery is displayed upon the uniquely styled lined pages with some special image manipulations that have never before been seen. The Grimoire also has special back reference sections featuring; New & Full Moon Phase Dates for October 2007 - December 2009, Herbs Section, Crystals & Stones together with a unique section for you to record special dates called "Remember". The Grimoire replaces Sabrina's original, previously published journal: The Book of Shadows; this special edition has over 100 more pages and the artwork lavishes most all pages while leaving plenty of room for the writer's special texts. The Grimoire is uniquely designed and ready for the writer to begin their very own special book as they fill the pages and bring it to life... We believe The Grimoire is the most unique journal/magical book on the market with lined pages, beautiful separator pages and of course, Sabrina's inspired artwork. Each page and image was hand designed by graphic artist and author, Starrfire Price to create a journey with each flip of the page. The Grimoire is uniquely designed and ready for the writer to begin their very own special book as they fill the pages and bring it to life... 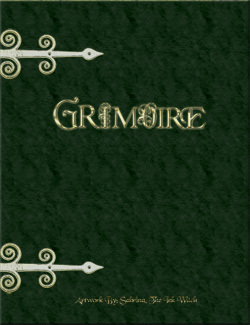 The Grimoire is a Large, Heavy 8.5 x 11 Hardback Book with 458 ppgs. of heavy, thick stock, natural paper with parchment like etching on every page. The weight of the book is approximately 3 pounds, Thickness is near 1 1/2 Inches. This book is absolutely a one of a kind!